One of my sources of discovering new books and writers to read are the yearly awards dedicated to speculative fiction. But over the years I’ve learned that some of these awards work better for me than others. Of course, the main reason is that such awards are a matter of subjectivism, but in the end my preference for one or the other is subject to a very personal view as well. An award that I follow ceremoniously each year since it was founded in 2007 is the Shirley Jackson Awards, because the Shirley Jackson Awards brought me many moments of satisfaction in the form of the books and stories I’ve discovered because of its list of nominees. In 2012, through one such list of nominees, S.P. Miskowski’s debut novel “Knock, Knock” came into my attention. A novel with supernatural elements, but without neglected the human nature, full of suspense, powerful characters and beautiful writing, “Knock, Knock” opened my eyes to a new, very strong writer. Then, it was only natural since my first reading of “Knock, Knock” to keep a closer watch on S.P. Miskowski’s further works. And the latest is an anthology of dark fiction co-edited by S.P. 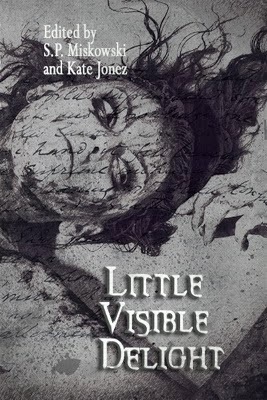 Miskowski with Kate Jonez released this week by Omnium Gatherum Media, a collection dedicated to the obsessions haunting the writers with stories in “Little Visible Delight”. However, not only my interest in S.P. Miskowksi’s new project made me curious about “Little Visible Delight”, but also the desire to see how the eleven writers found within the pages of this collection exorcise their obsessions. Especially since I cannot honestly say that I am a stranger to obsession, over time I had a couple of things that didn’t leave me be and pushed me to a tremendous effort in driving them out of my mind. Often the most powerful and moving stories are generated by writers who return time and again to a particular idea, theme, or image. Obsession in a writer's imagination can lead to accomplishment or to self-destruction. Consider Poe and his pale, dead bride; his fascination with confinement and mortality; his illness and premature death. Or Flannery O'Connor's far less soul-crushing fondness for peacocks. Some writers pay a high price for their obsessions, while others maintain a crucial distance. Whichever the case, obsessions can produce compelling fiction. Little Visible Delight is an anthology of original stories in which eleven authors of dark fiction explore some their most intimate, writerly obsessions. Thank you for posting about us, Mihai. The signal boost is much appreciated!